Since fall is in the air, with all the changing colors of the trees, I guess it's time for me to knit my younger son his own Candy Corn hat to go along with the season. YES!!! I have to say, I'm more into handmade stuffs and I'd like to make something for my adorable boys, so they can wear them at any time or during the season comes. It was simple to knit, didn't take me that long to finish a hat for a baby because there is nothing much design to use. Now, both my sons have their own pair of Candy Corn hat to wear this month or until the next occasion comes. Cute candy corn bonnet! I love it, very adorable! I too loves having handmade products. sis, may pang grown up ba nyan? You are so good na Mommy Nova. I wish I know how. 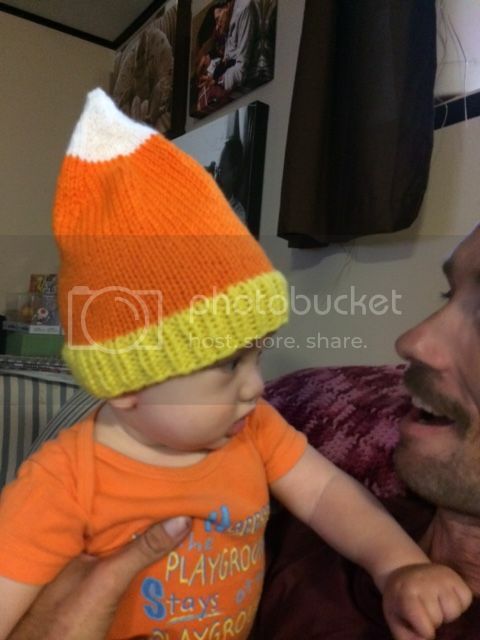 I want a candy corn hat, too! Lol! Seriously, that one looks good on your baby!